Born and raised in the Midwest, Sam comes to us from the wheat fields of southeastern Kansas. Sam studied Bio-Chemistry at the University of Kansas before heading West to pursue his passion of climbing and being in the wilderness. His adventures in the greater mountain ranges of the western United States fueled an inner belief that what made his experiences so meaningful were not just the rewards of accomplishing a challenging objective, but building close interpersonal relationships with his partners. 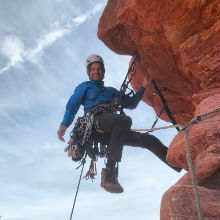 Emboldened by his belief in the enlightening power of the outdoors, Sam went on to become a youth climbing coach before making his way to Elements. Sam has enjoyed being an example of self-motivation and tenacity to the youth he has worked with thus far. He looks forward to watching himself and the students grow with their time at Elements. Sam is an AMGA Single Pitch Climbing Instructor, Wilderness First Responder, and Nationally Registered EMT. He spends his off shifts climbing rock spires, canyons, and peaks of the intermountain west.